Best Travel Tripods in 2019 | Manfrotto, Mefoto, Budget + More! When I wrote this post on the best travel tripods of the year, I never expected it to be so popular. It’s clear that photographers of every level are keen to invest in ways to support their precious cameras. At their most basic, tripods allow us to stabilise our shot for more creative freedom. Whether you want to blur water with a slow shutter speed, get the stability for a pin-sharp shot wide open, or simply shoot a selfie on timer mode, these 3-legged supporting acts are essential in every camera bag. Fortunately, there are numerous affordable, high quality options available in 2019. Stand out features include the ability to pan for expression of movement, monopod convertibility for increased flexibility, widened stance for macro shots, flexible legs to attach to trees… clearly there’s more than meets the eye to the humble tripod. Let’s have a quick look at my favourites so far this year. For this travel tripods review, I came up with a list of criteria, by which to score each of our three-legged friends. Size when folded – preferably as small as possible, but definitely less than 55cm (21″), the length limit of most budget airlines’ carry on bags. Size when extended – for comfort of use, being able to extend to around 125cm (50″) is preferable. Obviously this is irrelevant for tabletop tripods. Weight – whilst the lighter the better, travel tripods still need to have enough weight to them to prevent camera shake. Ideal weight is between 1-1.5kgs. Materials – carbon fiber is king here, for its combination of light weight and strength. However, it is more expensive, so other materials were also considered. Leg Quality – after extending/compacting multiple times around mud/salt water, do they still function well? Are the legs strong and sturdy? Head Quality – the head is what attaches your camera to the tripod. It needs to be strong, lightweight and compact, allowing the tripod to be folded down to a smaller silhouette. Overall Sturdiness – we tested the maximum listed carrying capacity of each tripod, then made a judgement on how much it wobbled under normal circumstances. Affordability – is the tripod within the budget of most consumers, not just working pros? 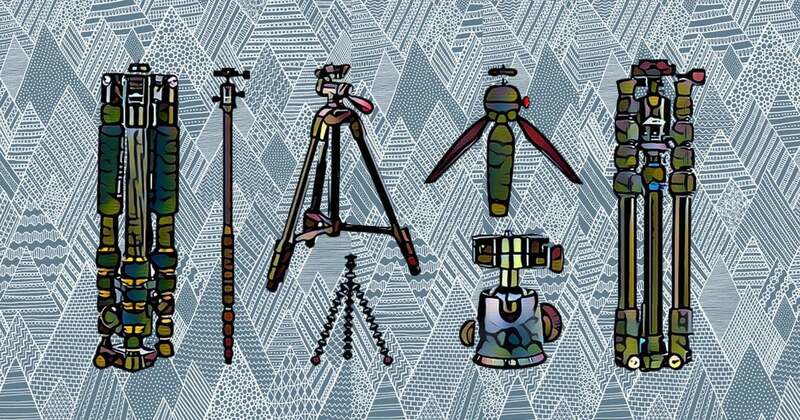 Only those tripods that excelled in all 8 categories were listed below. I also made a point to explore brand names you may not be familiar with, in search of bargain travel tripods which still excel in overall quality. If you’d like to read more about ways to support your camera, check out my post on the best DSLR tripods of the year. Why the Need for Travel Tripods? Packing your camera bag for your next trip, whether professional or for pleasure, always brings with it certain limitations. Whether you plan to take your camera gear as carry on or check in, weight limits and luggage size limits will always be an issue. Because of this, big, clunky tripods aren’t always top of the list when it comes to packing for travel. 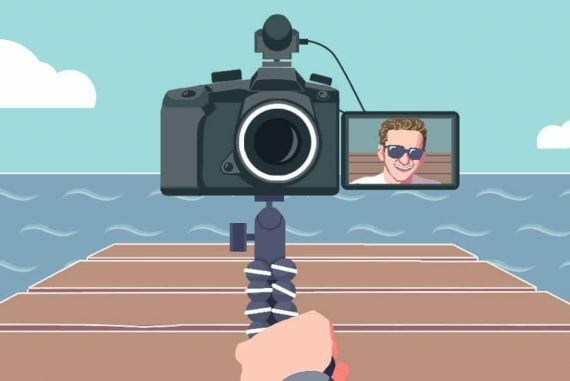 Unless you’re a landscape photographer who needs tack sharp shots, or a fashion blogger needing to set up the camera for selfies, it’s unlikely that you’ll use a tripod for more than 5% of your photography while away. However, it’s that 5% that many photographers are concerned with! Having a lightweight tripod at hand on your next trip could mean mailing a beautiful long-exposure shot of a stream cascading down a valley, or a pin-sharp shot of the stars at night, rather than walking away with a blurred mess! It could also be the best way to document yourself in your travels, allowing you to produce a well composed photograph of yourself in front of a sweeping vista. As with any of these ‘best’ articles, there’s a fair amount of subjectivity involved. Obviously what’s perfect for one photographer may not be right for another, but I’ve tried to approach these recommendations with an open mind. This is a list of my favourite tripods that I’d confidently give to any photographer, knowing that whatever choice they made from the selection would be a good one. So without further ado, let’s see the best of the bunch! Bring out the tripods! In an industry dominated by big corporate names, it’s refreshing to see a travel tripod company doing something completely different with their branding. 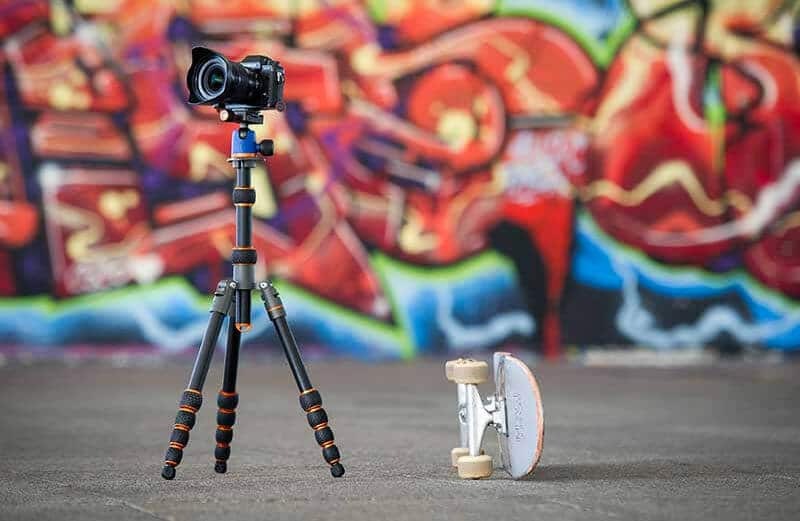 With its quirky product names, movie poster inspired artwork, and catchy website copy, 3 Legged Thing is the rebel of the tripod world, and has built up legions of faithful fans with its high quality, affordable tripods. After I noticed numerous comments about 3 Legged Thing tripods, I got hold of their aluminium 3 Legged Thing Punks Corey to see what all the fuss was about. With its edgy branding, 3 Legged Thing is the rebel of the tripod world. Featuring many of the same technologies that are found on our professional ranges, but made of durable, aircraft grade Magnesium Alloy, Corey is the perfect travel option for photographers who need their tripod to be as compact as possible. I love the way they speak about their tripods as if they are their sons – 3LT clearly has a lot of passion for what it’s doing! Let’s have a closer look at those pro-grade technologies that the Corey possesses. First off, there’s a Tri-mount plate, which features handy hanging hooks (to aid stability), and can be attached directly to the main tripod body so you can get as low as 4″ from the ground. Stand out from the crowd with the unique aesthetics of the Punks Corey. You can also attach the mount to the detachable monopod leg, another bonus feature on a travel tripod of this size. The Tri-mount plate features three holes in which you can attach optional accessories, such as a laptop plate. Then there’s the detachable feet of the Corey (which 3LT call ‘Bootz’! ), which can be replaced for a range of other spikey foot accessories sold by 3LT, increasing stability and traction depending on the terrain. I haven’t seen this feature on any other travel tripod. The main benefits of the Punks Corey revolve around its size and weight. The collapsed height of only 34cm means that it’s a great travel tripod choice to attach to the outside of a camera backpack, or even stuffed inside some of the larger camera bags. The Punks Corey can be attached comfortably to a camera backpack or inside most rolling camera bags. I was pleasantly surprised it slide easily into my Think Tank rolling camera bag, without having to remove the ball head. As for operation, the Punks Corey features a ‘Bubble Grip’ system, which basically means that instead of the flat-sided rubber grips you often see on travel tripods, this one has rounded, bubble-like grips. I found the twist-to-lock mechanism smooth and easy to operate. The legs can be locked in 3 different angles and inverted 180 degrees when you’re done. The centre column can also be inverted, and allows for some flexible laptop/camera setups – check the video out below for an example. The maximum load of the 3 Legged Thing Punks Corey is an impressive 30 lbs (13.6 kgs), which is more than enough to hold a large bodied DSLR with zoom lens. As with all tripods of this diminished size/weight, the fifth and final section of the Punks Corey’s legs are thin and pliable, but if you choose your terrain, angle and carry load wisely, they’re adequately sturdy. Suspending weights from the centre-column or mount plate can also help to achieve a more stable shot. The legs are built from aircraft grade magnesium alloy and feel solid and durable. The functionality of the Punks Corey can be extended by various ‘footwear’ and ‘headwear’, sold separately. A nice addition are the 3 spirit levels, with 2 residing on the AirHed Neo ball head, which features 2 knobs that control pan, rotation and orbit. Operation is fluid, and the rubberized grips provide sufficient leverage to ensure a firm hold. 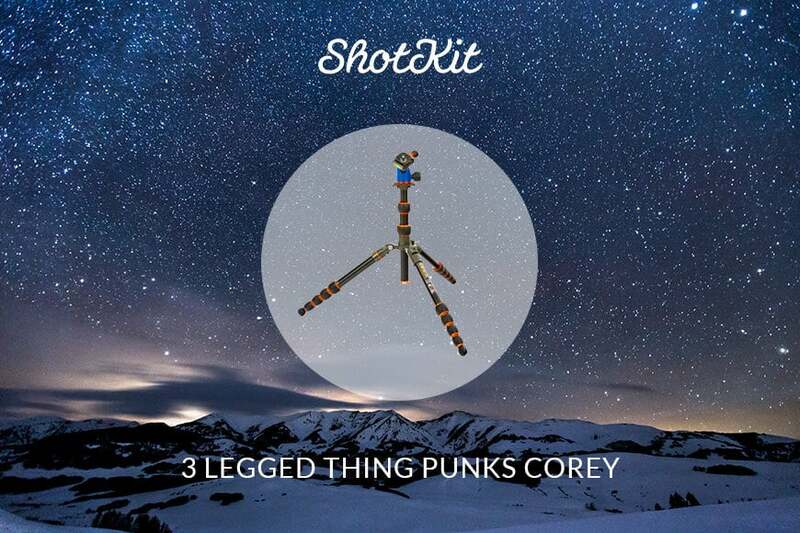 If you’re looking for a lightweight travel tripod which stands out from the crowd and has a unique feature set, the 3 Legged Thing Punks Corey is a great choice. You’ll be affectionately calling it by its first name soon enough too…! Arguably the best portable tripod ever produced, Joby really rewrote the rule book with their Gorillapod range of flexible tripods. Whilst every other tripod manufacturer was concentrating on making tripods with rigid legs, Joby turned the rules upside down and released a tripod that was built to flex. The ingenious small tripod is a way for photographers to attach their cameras to almost anything. 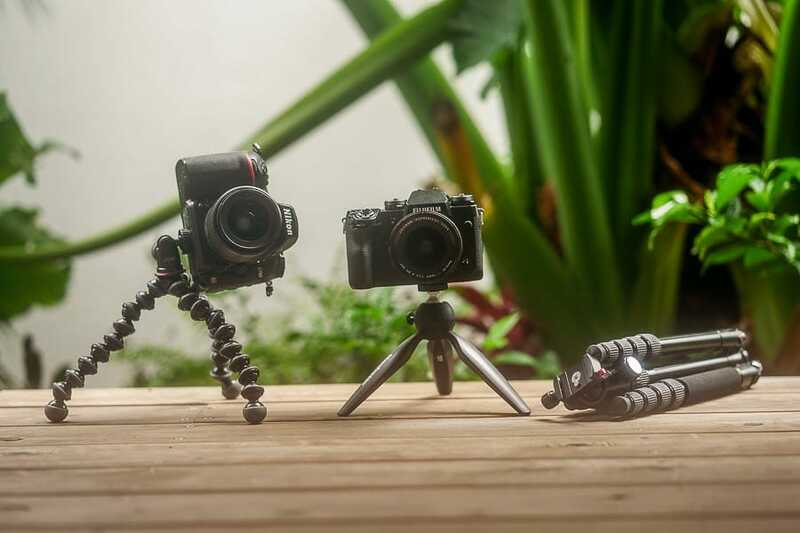 Rather than be used to stand upright on its legs, the Gorillapod’s legs can be bent and shaped to wrap around static items, securely holding your camera in previously unimaginable spots. The GorillaPod Focus being used without the Ballhead X. The GorillaPod Focus is the most popular portable tripod in the range, offering a maximum load of 11 lbs (5 kgs) – enough to support even a pro-body dSLR, zoom lens and flash! (e.g. Nikon D5 +70-200mm f/2.8 zoom lens + SB-910 flash = 8.4 lbs (3.85 kgs)). We’d recommend you pay a little extra for the Gorillapod Focus + Ballhead X attachment, which makes the Gorillapod much more versatile. The 360 degree pan and 90 degree tilt knobs on the Ballhead X tighten independently allowing you extra-versatility as you capture your image or pan your video footage. This means that you can wrap the legs of the GorillaPod Focus around your chosen object, then use the knobs on the Ballhead to fine tune your composition. 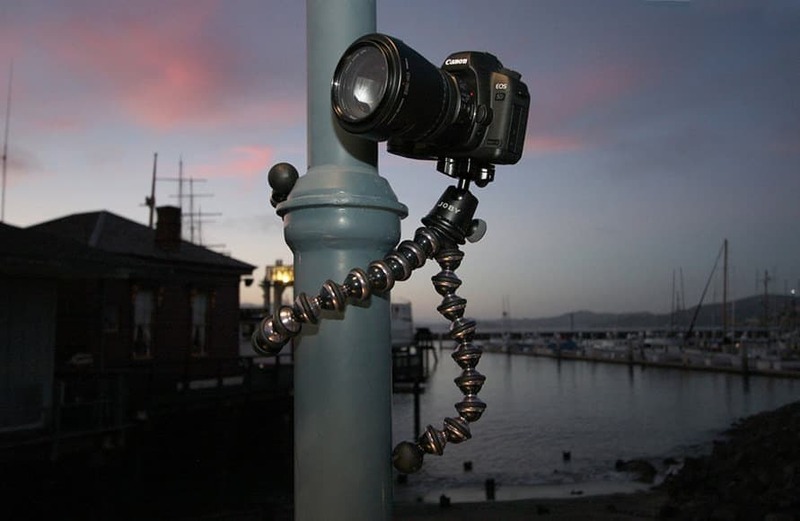 The Ballhead X fastens to the camera with a high-quality Arca Swiss quick release plate, which many photographers choose to leave in place for an entire shoot (if not forever), allowing a quick interchange with the GorillaPod Focus. If your shot doesn’t require this level of fine-tuning, you can remove the Ballhead completely for an even more lightweight setup. It’s also a hugely popular tripod for vlog cameras that YouTubers use – see the best cameras for vlogging. The GorillaPod Focus being used with the Ballhead X. 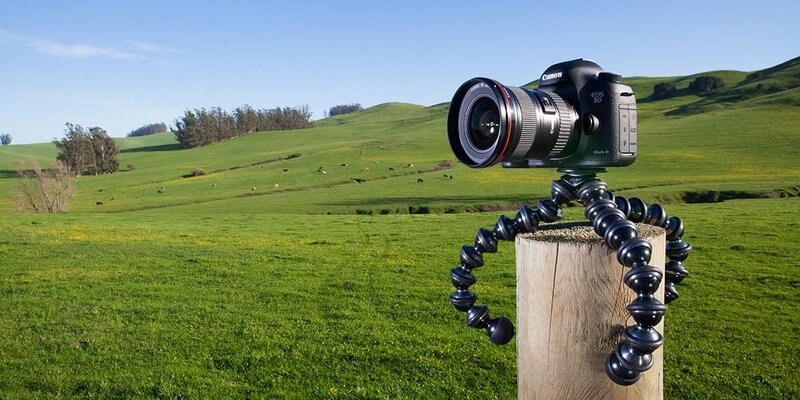 The GorillaPod Focus lives up to its ‘gorilla’ namesake, providing strength just where you need it. With machined aluminium sockets, German TPE joins, rubberized foot grips, Zinc-Aluminium and stainless steel plates, your camera gear will stand strong even on the roughest terrain. One of the reasons why I love the GorillaPod Focus + Ballhead X combo is that you can carry your camera set up quite comfortable by the Gorillapod legs with the camera still attached. I’ve seen photographers do this a lot, holding the Gorillapod by the legs and letting the camera dangle beneath, ready to deploy the Gorillapod as soon as necessary. If you’re interested in using the GorillaPod Focus for video, Joby has produced a useful video of tips for handheld filming here. The Ballhead X allows the camera to be adjusted more accurately than using the GorillaPod Focus alone. There are many cheap imitations of the GorillaPod Focus on the market, and I must admit I’ve purchased one in the past too. However, I would strongly advise not being tempted by the cheaper prices like I was. The GorillaPod Focus would have to be one of my favorites of the bunch. It’s small, lightweight, strong and incredibly versatile, allowing you to be 100x more creative with your tripod-assisted photography than a regular tripod. The GorillaPod is simply the best mini tripod for those who want to travel as light as possible, and want to be able to secure their cameras in odd places! 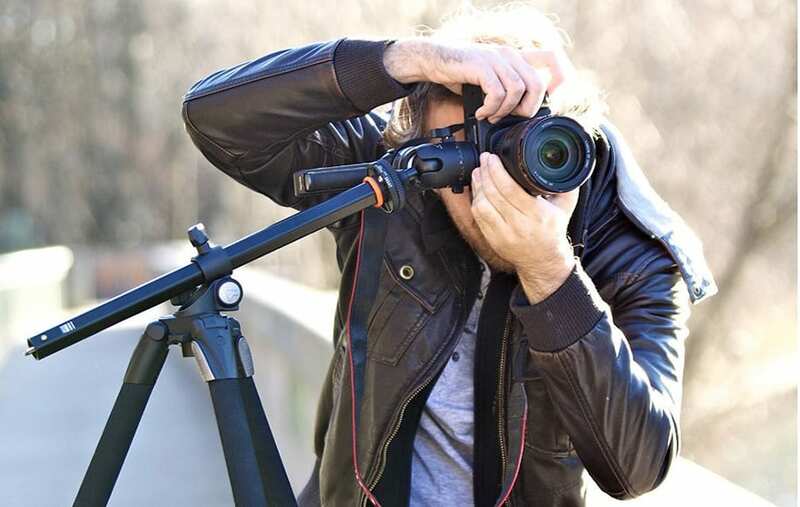 MeFOTO is a relatively new brand in the photography industry but has quickly positioned itself as a maker of some of the best lightweight tripods in 2019. 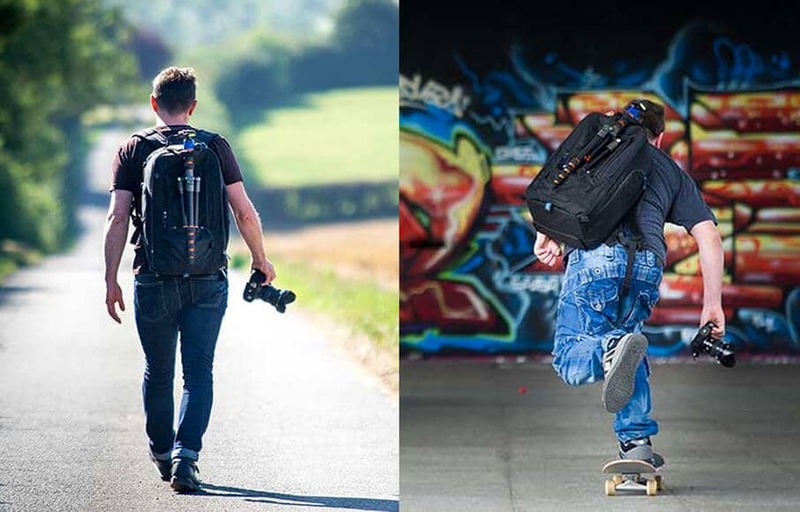 At present, MeFOTO offers one style of tripod in 3 sizes – the BackPacker (S), the RoadTrip (M) and the Globe Trotter (L). As you can tell by the names, all 3 are travel tripods, aimed at the photographer who wants to ensure a steady shot on their next trip. We’ve chosen the mid-size MeFOTO Aluminum Roadtrip to include in this list, since in our minds it offers the best balance of size, portability, price and functionality of the 3. It should also be mentioned at this point that the MeFOTO Aluminum Roadtrip is available in 9, yes NINE different colours! As if MeFOTO wasn’t making the choice between the 3 sizes and 3 materials (aluminium, titanium and carbon fiber) of its tripods hard enough, they have to throw in 9 different colours too! The MeFOTO is certainly the best camera tripod for photographers who don’t want to look like photographers – the funky colours actually make you look like an amateur, which can actually help in places where commercial photography is not permitted. The Aluminium Roadtrip travel tripod is available in 9 colours and the Carbon Fiber model is available in 5. The MeFOTO Aluminum Roadtrip is not that much smaller in height than its bigger brother the Globe Trotter, but the build is significantly thinner. This means it can’t hold as much weight, but on the flip side, the MeFOTO Aluminum Roadtrip is much lighter and more portable. The MeFOTO Aluminum Roadtrip can hold a maximum load of 17.6 lbs (7.9 kgs). By way of example, a great travel camera set up such as the Fuji X-T2 + Fuji 23mm f/1.4 (or other lightweight Fujifilm X lenses) weighs in at only 1.7 lbs (803 g), so it’s clear that the MeFOTO Aluminum Roadtrip is made for both mirrorless cameras as well as their heavier dSLR counterparts. Folding up the the MeFOTO Aluminum Roadtrip is a simple task of sliding each leg into itself, then folding it vertically 180 degrees (back on itself). The collapsed size of the tripod is an impressive 72 cm long, which means that it can fit into a backpack or even a small rolling camera bag such as my favourite, the Think Tank Airport Advantage. One thing that you may have to get used to with a tripod that folds away in this manner is that you’ll no longer be able to grab a tripod leg to pick up the tripod when it’s laying down in its folded state. This is because the leg will start unfolding on itself, rather than stay in place like other tripods whose legs don’t fold in this way. It’s a good job the MeFOTO Aluminum Roadtrip comes with an attractive carrying bag, or you can always just grab it by two of the legs at once. The MeFOTO Aluminum Roadtrip‘s legs extend via a twist mechanism. Larger tripods often use a flip-lever mechanism that some photographers prefer, but the twist mechanism is way more practical for travel tripods due to the size and weight advantages. It’s also faster to extend all legs in a column at once by twisting all the fastenings at once. The stand out feature of the MeFOTO Aluminum Roadtrip is that it doubles as a monopod. By unscrewing one of the legs and removing the middle section from the base, both can connect to make an impressive monopod. One of the legs can be detached from the MeFOTO to create a monopod. Monopods are usually a confusing item for newcomers, but those who use them, swear by their versatility. Aside from providing a stable yet mobile alternative to the cumbersome tripod, they can also be used by assistants as mobile lighting stands. 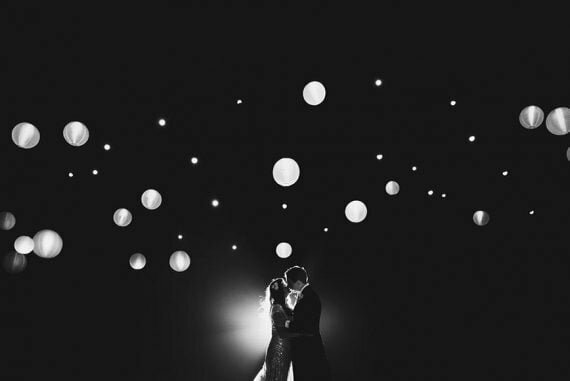 I often see wedding photographers backlighting their subjects on the dance floor using a remote flash attached to a monopod, for example. The legs of the MeFOTO Aluminum Roadtrip lock in two stages – one very close to the ground and one at a more standard height. This means that you are forced to use either of the leg heights which may be an annoyance to some. However, we didn’t mind the standard height which seemed to serve most purposes, and the second lower height was fine as an alternative. The included ballhead is a simple twist and pan set-up, offering fast opening/closing via twistable knobs. The pan mechanism is smooth to operate, allowing sports photographers to get stable panning shots which seem to be so popular on the motorsports circuit. The Arca Swiss plate requires a screwdriver (or coin) to tighten, something that annoyed me a little since I don’t always have these items on me. I found myself using the tip of my house keys when in a pinch. This type of tripod plate closure is the most common, so it’s something we need to get used to. To get a closer look at the opening/closing mechanism as well as the other functions of this tripod, take a look at this great review that our friends over at SLRLounge produced a few years ago – despite the age of the video, all the information still stand correct. The other massive advantage of the MeFOTO Aluminum Roadtrip is its weight, or rather its strength:weight ratio. As I mentioned earlier, it can carry a decent load, but still manages to be lightweight at only 3.6lbs. We chose the Aluminium Roadtrip over the carbon fiber model purely due to the price difference, but you can shave off another half a pound for an extra $140 or so if you go for the MeFOTO Carbon Fiber Roadtrip. On the question of price, the MeFOTO Aluminum Roadtrip really is great value. When you consider you’re getting a well-made, colour-coordinated, lightweight tripod which doubles as a monopod and includes a bag, the MeFOTO Aluminium Roadtrip really is one of the best tripods available today. What is it with travel tripods and multiple colour options?! 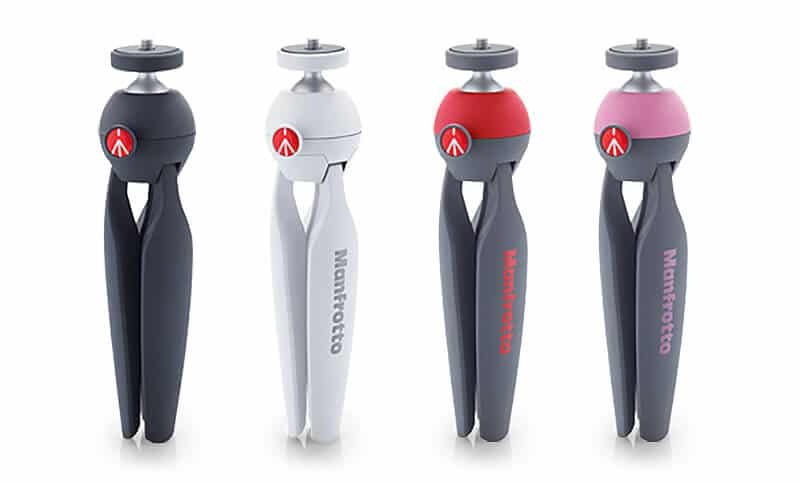 The Manfrotto BeFree aluminium travel tripod continues the trend of jazzing up your camera bag with its 5 colours, but don’t discount it as a kids toy – Manfrotto has long been the name in tripods. I’ve owned two Manfrotto tripods over my years as a wedding photographer, and have loved both of them. If I didn’t already own a travel tripod, I’d probably get the Manfrotto BeFree too! The Manfrotto BeFree uses Manfrotto’s traditional flip-levers to open and lock the legs. I much prefer this style over the more popular ‘twist’ mechanism, since I find it easier to control with my large hands, and I like being able to easily tell if a leg is unlocked just by looking at it. I also find it easier to open multiple legs at once (by flipping all levers together), but many photographers argue the same with the ‘twisties’ – I’d recommend you have a try yourself to see which you prefer. Angling the legs on the Manfrotto BeFree tripod involves rotating a rather unusual latch locking mechanism with 3 positions – folded, normal angle and wide. Similar to other travel tripods, this limited functionality may take some getting used to, but you’ll soon realise that it’s fine for 99% of situations. As its name suggests, the main draw card of the Manfrotto BeFree is its size and weight – it allows you to be… free! However, in order to shave pounds off the size of the Manfrotto BeFree, there had to of course be some compromises in the build and height. When fully extended, the Manfrotto BeFree stands at 144 cm, which means you’ll be bending over or crouching down a lot. I find that using a flip up LCD screen and live view to be perfect for composing in this situation, though not all cameras have this functionality. In addition, the bottom section of the Manfrotto BeFree‘s legs are rather spindly, so you’ll need to make sure you’re sticking to well within the maximum load capacity of 8.8 lbs. 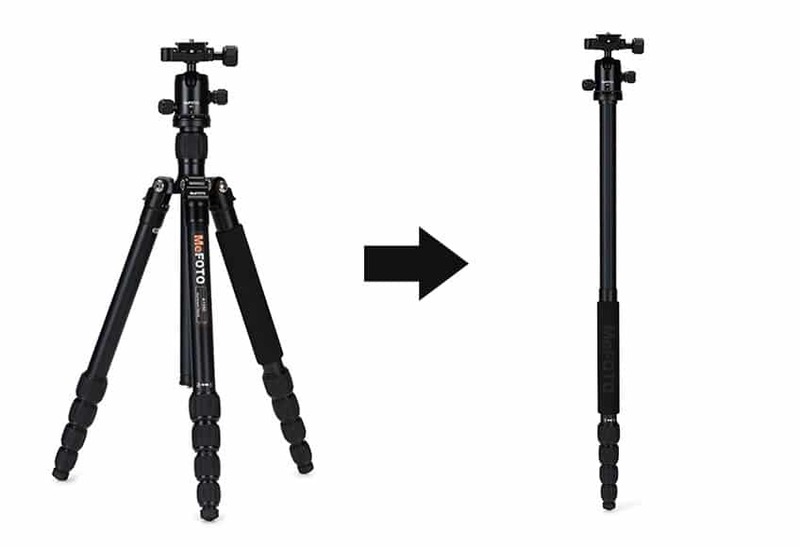 The Manfrotto BeFree travel tripod features unique twisting leg releases. For those of you who want to use the Manfrotto BeFree in stronger winds, or more unstable surfaces (like grass for example), I’d recommend using a shutter release cable, infrared remote, or simply your camera’s self-timer mode to get the most stable exposure possible. The head of the Manfrotto BeFree is very lightweight, but in turn, very basic. Those used to the tank-like construction of other tripods in the Manfrotto lineup may be disappointed, but it’s important to remember that this is a portable travel tripod first and foremost. The RC2 quick release system consists of a lever which opens and locks the tripod plate of the camera in place. To twist the camera around its axis, you loosen a plastic knob on the side of the ballhead. Again, the build isn’t exactly bulletproof, but lightweight it certainly is. The feature I like the most about the Manfrotto BeFree after its size/weight is the way the legs fold up neatly around the ballhead. After sliding each leg into itself and rotating it 180 degrees back on itself, the legs nestle neatly into the grooves of the sides of the ballhead. This kind of design is unique to the Manfrotto BeFree, and is testament to the attention of detail of Manfrotto products. Once the tripod is folded up, you can sling it into your backpack or use the included carrying bag – the extra padding makes it easy to pack in your checkin luggage while protecting it from damage. However, the Manfrotto BeFree is clearly aimed at travellers who want to shave every last ounce off their carry on limits. Due to its size limitations, we’d recommend sticking to usage with mirrorless cameras (like these) or even compact cameras, many of which produce image quality just as good if not better than heavier dSLRs. Some of the reviews on Amazon do mention usage of the Manfrotto BeFree with pro body dSLRs, but it all depends on the conditions of the ground the tripod is standing on and the amount of wind. To summarise, if you’re a traveller who needs to attach a mid-sized tripod to their backpack on long hikes, or simply someone who wants to be able carry their camera bag for long periods, the lightweight and compact Manfrotto BeFree should definitely be on your shortlist. The only problem now is deciding on the colour…! Even before I read this, this popular tripod was on my radar as I noticed it had over 700 positive reviews on Amazon. I often look to the impartial user reviews on Amazon for reassurance for these ‘best of’ posts, and seeing so many happy owners of the Vanguard Alta Pro 263AB 100, I knew it had to be a candidate on this list. You can purchase the Vanguard Alta Pro 263AB 100 without a ballhead, but we’d recommend going for the tripod kit which offers the best value for money. In fact, the Vanguard Alta Pro 263AB 100 offers some unique features that are not often seen at this price point. 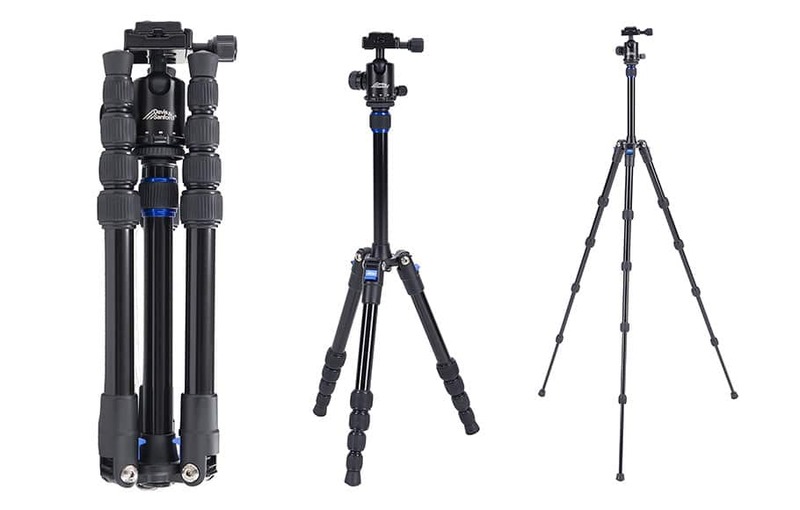 Whilst several of the travel tripods in this roundup only offer limited positions at which you can move the central column , the Vanguard Alta Pro 263AB 100 offers a Multi-Angle Central Column (MACC), allowing you to move it from 0-130 degrees in multiple vertical and horizontal positions without the need to remove it from the tripod. In practice, this makes it much easier to get the tripod in the right position for everything from macro photography to wide-angles. The MACC can also be flipped a full 180 degrees to suspend the camera upside down, allowing the camera to get even closer to the ground. Anyone who does product or macro photography will love the low minimum height of just 27cm of the Vanguard Alta Pro 263AB 100. Another innovative feature is the Instant-Swivel-and-Lock (ISSL) mechanism which allows photographers to move and lock the central column in one simple movement. By twisting a locking lever and pressing a button, you can slide the central column up or down, then use another switch to tilt the column to the perfect position for your shot. The inclusion of a bubble level on a travel tripod at this price is a welcome feature, and the Vanguard Alta Pro 263AB 100 has not one but three of them to help you find a perfectly flat position. Although many cameras offer a spirit level function within their menus these days, it’s nice to have a visual reference on the tripod itself for efficiency. The legs of the Vanguard Alta Pro 263AB 100 have settings for 25, 50 and 80 degrees, with easy-release buttons for quick set up. 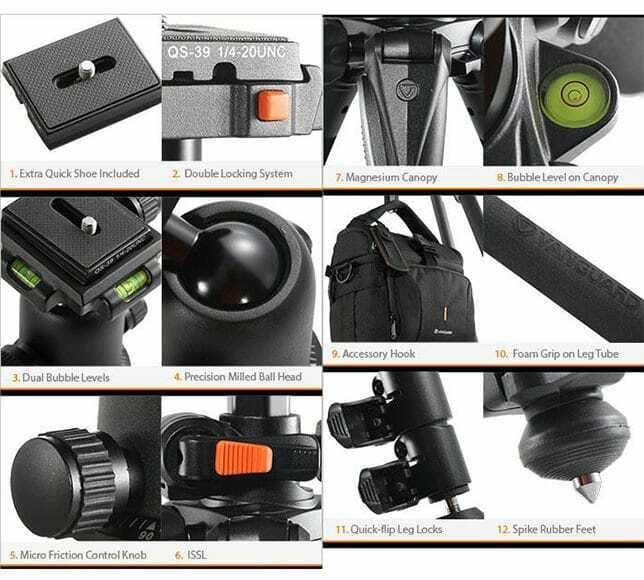 Other welcome inclusions that are unusual on a travel tripod for under $150 are retractable spiked rubber feet, a spring-loaded, retractable weight hook and even a carrying bag. The spiked rubber feet are invaluable on grass and other non-solid ground types (of which travellers encounter many), and combined with the some form of ballast hung on the weight hook, the Vanguard Alta Pro 263AB 100 provides one of the most stable operating platforms of any of the tripods on this list. By angling the centre column away from the middle of the tripod, you are able to position yourself behind the camera more comfortably to get the shot you want. Vanguard actually includes a ballast bag (essentially somewhere to place a weighty object, such as stones), which can be secured to the lower portion of the tripod’s legs, providing even more stability to your shot. In terms of build quality, the Vanguard Alta Pro 263AB 100 sports a premium magnesium die-cast canopy with aluminium allow legs (again, we recommend aluminium over the carbon fiber model unless you have the spare cash or really need to shave off the weight). Another great feature which highlights the excellent build of the Vanguard Alta Pro 263AB 100, is the anti-shock rubber ring, which provides padding for when you inevitably ‘drop’ the central column back in place. The Vanguard Alta Pro 263AB 100 isn’t billed specifically as a travel tripod, and as such isn’t a particularly lightweight tripod, tipping the scales at (5.38 lbs/2.44 kg). 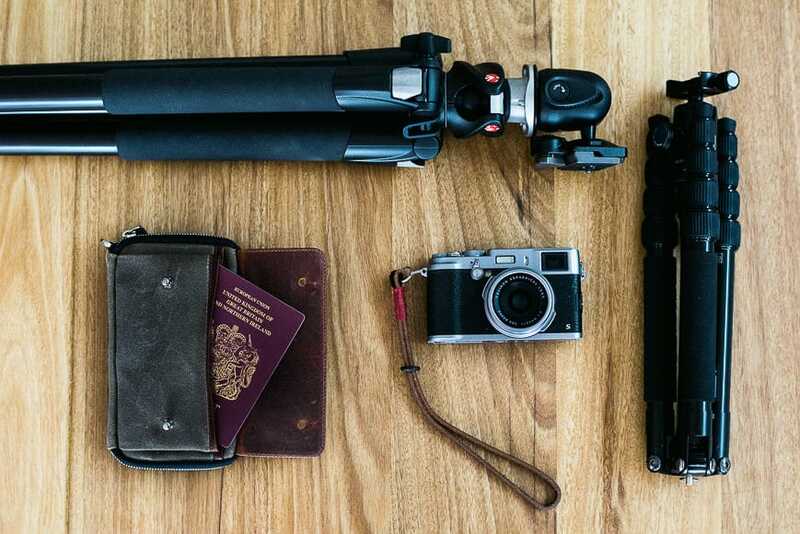 This is by no means heavy for a tripod, but travellers who need to save every last ounce from their carry on luggage may prefer one of the specific lightweight travel tripods on this list. The impressive feature set of the Vanguard Alta Pro 263AB. The weight of the Vanguard Alta Pro 263AB 100 is in part due to its tall maximum standing height of 68″ (173 cm), which means comfortable usage for the average photographer. If you’re due to be using your tripod frequently, the maximum standing height is one of the most important factors to consider – you’ll quickly grow tired of stooping, even just a little bit, every single time you need to get that stable shot. With a maximum load capacity of 15.4 lbs (7 kgs), the Vanguard Alta Pro 263AB 100 is firmly placed in professional camera gear territory, meaning it can carry pretty much any regular camera/lens set up with ease. The combination of extreme low-angle photography options, decent maximum height, unique features and excellent value for money makes the Vanguard Alta Pro 263AB 100 the best all round tripods available today. Whilst it’s not the absolute best tripod by any stretch, it will appeal to many photographers, whether you choose to take it on holiday or merely use it locally. 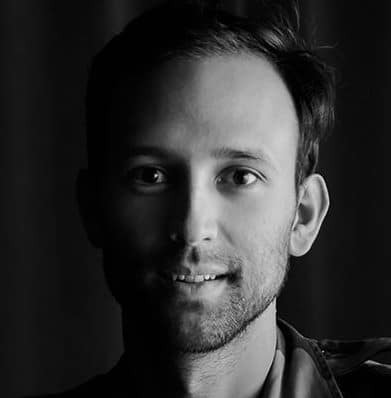 Davis & Sanford is made by Tiffen, whose name may be more familiar to photographers. Tiffen produce bags among other products, including several camera bags featured in the best camera bags of 2019. The main benefit of the Davis & Sanford Traverse TR553-P228 is its unique ability to collapse to only a foot in length (roughly 30cm). It achieves this by inverting the tripod legs 180 degrees so that the ball head is concealed within the legs. For those who’ve never handled a travel tripod before, take it from us that reaching this amount of compactness is an impressive feat. Weighing in at only 2.6 lbs (1.17 kg), the Davis & Sanford Traverse TR553-P228 is firmly placed on the best tripod for travel list, whilst still offering a more than adequate maximum load of 10 lbs (4.5 kg). To give you an idea of weight, a Nikon D500 with a heavy zoom lens such as the Nikon 24-70mm f/2.8 weighs in at around 3.8 lbs (1.76 kg). Travellers will of course usually have an even lighter set up that this. The Davis & Sanford Traverse TR553-P228 remains small when collapsed but can extend to a decent height too. The ballhead of the Davis & Sanford Traverse tripod features a locking knob to control the ball movement and a separate locking knob for the panning movement, which we found buttery smooth in practice. The ballhead also features a calibrated base and bubble level, helping photographers achieve a precise set up. The Arca-Swiss compatible release plate can be quickly removed from the ballhead, and is lightweight and low profile, perfect for cameras of all sizes. The solid ballhead sits on top of 5-section aluminium legs which have twist locks, allowing for quick adjustment to your preferred height. The solid ball head of the Davis & Sanford Traverse features a bubble level and precision markings. There are 3 different locking angles at which to stand the Davis & Sanford Traverse TR553-P228. The 5-section aluminium legs feature simple to operate twist locks, allowing for quick height adjustments up to 53″ (134 cm). Tripods such as this one tend not to be as stable as their heavier counterparts. That’s why the inclusion of a ballast hook, allowing you to hang a weight (such as your camera bag), is such a useful feature on the Davis & Sanford Traverse TR553-P228. By adding more weight to the centre of the tripod, you can maximise stability with heavy loads, on uneven ground, or in windy conditions. At around one hundred dollars, the Davis & Sanford Traverse TR553-P228 is a high quality, remarkably compact travel tripod that should suit most budgets. If you’re not bothered by the relatively modest maximum height when fully extended, this is a tripod that can fit in any traveller’s backpack (read reviews of some great backpacks here). Whether you’re a professional or an amateur photographer, it’s always important to be able to travel as efficiently as possible (see here for other travel tips for photographers). If you really must take a tripod with you to achieve a certain type of shot, we’d always recommend choosing the smallest, lightest one that you still feel comfortable using. For its combination of affordability and compactness, the Davis & Sanford Traverse TR553-P228 is a tripod that should definitely be included on your shortlist. Up until this point we’ve only been recommending aluminium or plastic tripods for traveling photographers. Even though carbon fiber is stronger, lighter and more durable, its price usually puts it out of reach for most photographers. The ZOMEI Z699C however, turns all that on its head. I’d usually not recommend a photography product made by any of the lesser-known manufacturers, especially when it’s a product that needs to support expensive camera gear. However, after reading so many positive reviews of this impressive little tripod (see over 130 of them here), I knew I had to take a closer look to see what all the fuss was about! Dubious brand name aside, it’s hard not to be impressed by all the ZOMEI Z699C has to offer. Top of the list is the carbon fiber construction, offering more durability and less weight than aluminium alloy, but at a surprisingly affordable price (there’s currently a discount here at Amazon). Measuring in at a traveling-photographer -friendly 13.7″ (35 cm), the ZOMEI Z699C can be packed away easily in your carry-on luggage, or simply in the included tripod bag if you prefer. The Zomei Z699C can be angled into multiple positions, allowing easier macro, astrology, product or many other forms of fixed position photography. Despite its relatively small folded footprint, the ZOMEI Z699C can extend up to an impressive 59.4″ (151 cm) – not an ideal height for taller photographers, but still useful for most situations. The ballhead features precision markings around the circumference for panoramic photography work, and a smooth panning motion via an adjustable side knob. The ballhead can be panned and tilted around its axis, and release of the tripod plate is via another twistable knob. A neat addition is the tiny spirit level, which ensures your camera is set up perfectly flat. The humble spirit level is a hugely underrated feature on tripods, and in my opinion it should be present on all of them. 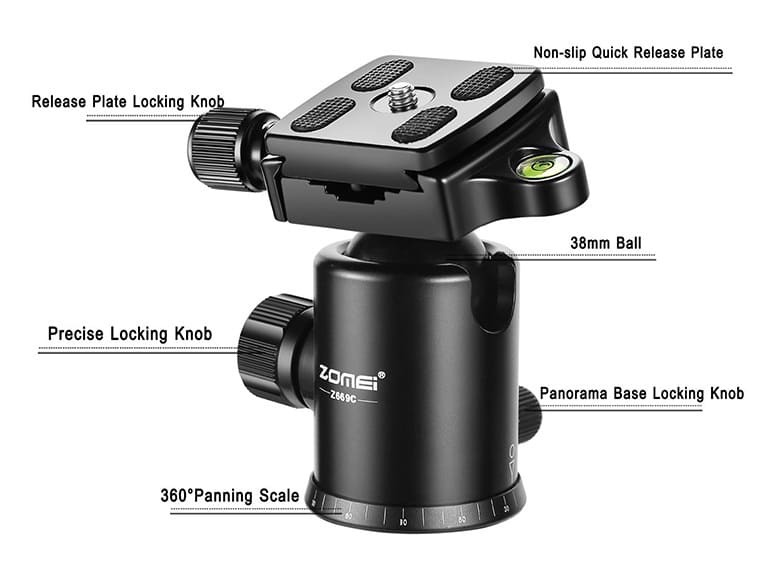 A lot of thought has gone into every design element of the Zomei Z699C travel tripod, all the way down to its ballhead. What’s really impressive about the ZOMEI Z699C is its carrying capacity. Thanks to its carbon fiber construction, this tripod offers a maximum load of 33 lbs (15 kg), making it the strongest in our roundup so it’s an ideal travel tripod for those using a heavy DSLR plus wide angle lens for Canon or Nikon type setup. Most photographers are unlikely to reach even half of the maximum load, with even the bulkiest regular dSLR + zoom set up tipping the scales at far less than 15 kg. Monopods are often misunderstood by photographers, but they’re actually very useful, allowing some of the stability of a tripod, as well as a lot more mobility. The Zomei Z699C travel tripod can be converted into a monopod, among a long list of other useful features. The central column can be removed completely and flipped upside down to provide an inverted tripod set up, perfect for macro photographers. 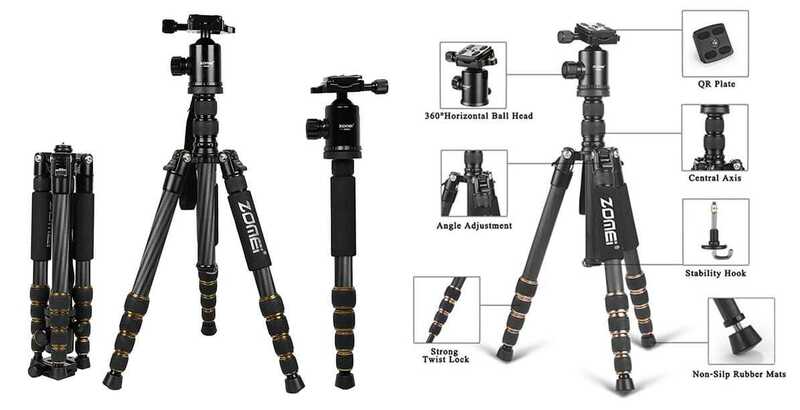 Other minor but welcome details on the ZOMEI Z699C carbon fiber tripod include gold accented leg joints, sponge leg grips and a hand strap that could double as a place to hang a weight, to achieve a more stable shot. It’s also worth noting that the carbon fiber used in the ZOMEI Z699C features 8 layers of weaving, making for an incredibly strong, lightweight traveller’s tripod. For more than half the price of the ‘big-name’ carbon fiber tripods on the market, it’s hard to ignore the ZOMEI Z699C. They’ll always be photographers who refuse to trust any brand they haven’t heard of (especially if it’s made in China! ), but my advice to them would be to look to the reviews for reassurance. If you’re willing to try something new, the ZOMEI Z699C is the most affordable way to get a carbon fiber tripod into your backpack, and with an impressive feature set to boot, this is one of the best value travel tripods we’ve ever seen. The Sony VCT-R100 is a lightweight compact tripod which has sneaked into our roundup. At first glance it appears to be a tripod aimed at only the newest amateurs, but upon closer inspection, it’s actually an almost ideal backpacking tripod for photographers on a budget. The first thing to note about the Sony VCT-R100 is that it has somewhat limited usage applications when compared to the other travel tripods in this post. It seems to have been designed more for the newcomer videographer, with its fixed position tripod legs and panhead with lever. However this doesn’t mean that it can’t be useful when used by photographers. Sometimes simple is best, and when all you need is a tripod to hold your camera steady, the Sony VCT-R100 does a great job of that task, albeit only up to 1 kg. This carry capacity limits the Sony VCT-R100 to mirrorless or compact camera territory, or if you really need to use a dSLR you’d have to have to be using an entry level lightweight model and lens (such as these best dslr cameras for under $500). There are no bubble levels, reversible centre columns, spiked feet or ballast hooks on the Sony VCT-R100, but instead you’re met with complete simplicity. After you’ve attached your camera to the 3-way pan/tilt head, all you need to do is simply splay open the tripod legs to their one fixed position, then open the 3 levers on each leg at the same time to extend them to a maximum height of just under a metre. The lever style panhead allows for smooth panning shots for video or long exposure sports photography, where you need to follow the action without moving yourself. The Sony VCT-R100 is a simple and popular tripod, often available for bargain-basement prices. Due to its simple design, the Sony VCT-R100 is the quickest to go from collapsed to extended of all the travel tripods we tested. There’s no fiddling around with levers, latches or twist joints – you can pull open the legs to the braced position, then release all three legs and have them locked in under 5 seconds. For the traveling photographer who needs to set up shot as quickly as possible, this tripod is ideal. The Sony VCT-R100 weighs in at a lightweight 1.8 lbs (816 g), due in most part to its modest extended height. Clearly it isn’t a tripod that you’ll want to be using for extended periods unless you don’t mind stooping down to 1m frequently. 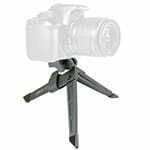 This is a travel tripod designed to be deployed and retracted quickly. The final feature to note about the Sony VCT-R100 tripod is its price. At the time of writing, Amazon was stocking it on sale for under $30 – you can click here to see if this is still the case, but even at full price, it still comes in at under $40 which is incredible! It’s clear that the Sony VCT-R100 is aimed at a photographer who only needs the most basic and affordable travel tripod, but to that photographer, we think it is perfect. As long as your camera set up is under 1kg in total weight, we couldn’t find a simpler tripod that just does its job then packs away in a flash. If you want a no-nonsense, cheap travel tripod that can be slung into your backpack and forgotten about, grab a Sony VCT-R100 – you won’t regret it. 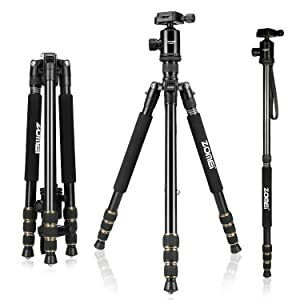 Continuing on with the best budget travel tripod options, this Dolica AX620B100 is currently the most popular tripod on Amazon, with an incredible 2,632 reviews at the time of writing! Normally ‘budget tripod’ would be a no-no – after all, who in their right mind would skimp on the cost of the very thing that supports potentially thousands of dollars in camera gear?! However with that said, there are exceptions to the rule, and the Dolica AX620B100 Proline travel tripod is one of them. In fact, the Dolica AX620B100 offers many features not normally found on budget tripods, making it great value for money. The foam padding on all 3 legs (most travel tripods only feature padding on 2 legs) helps not only with grip, but also for when you carry your tripod with camera attached over your shoulder. I’ve seen a lot of photographers carry their tripod/camera in this way, particularly if they expect to be shooting tripod-assisted shots in multiple close locations. The 4-section legs are quickly extendable with lever locks right up to a decent height of 60″ (152 cm). If you’re placing the Dolica AX620B100 on softer surfaces such as grass, a spike can be extended out from the rubber feet to aid with grip. The Dolica AX620B100 Proline travel tripod can be angled in multiple ways to match the exact position of your subject. The tripod legs can be fixed into 3 positions using the leg adjustment locks, allowing the Dolica AX620B100 to sink down to a minimum height with the central column down of 21.5″ (54 cm). Other smaller details not normally found on a budget tripod include two bubble levels, one on the ballhead and one on the tripod leg, and even a miniature compass which may aid with finding the direction of the sun during sunset for example. The ballhead is slightly plasticky, but that of course does help with the price and the weight of the Dolica AX620B100. However, since it is removable, you’re welcome to invest in a more robust ballhead if you prefer, although under normal usage we don’t think this is necessary. In fact, if you read the reviews here about the durability of this budget tripod, you’ll see that very few users have any complaints in that respect. Finally there’s a counter-weight hook on the central column which allows you to hang a small bag on to the tripod to provide an even more stable shot. Also included is a good-looking carrying bag. For a budget tripod that weighs just over a kilogram (13.2 lbs) to be able to support almost 6kg (13.2 lb) is very impressive. This puts the Dolica AX620B100 into the pro-body dSLR load-bearing category, meaning it’s an equally popular travel tripod for professionals and amateurs alike. There’s even a 5 year warranty with the Dolica AX620B100, giving you the peace of mind that sometimes ‘budget’ doesn’t equal poor quality. If you want a stylish, well-built budget travel tripod with professional features that’s priced for every photographer’s wallet, we’ve got to say that the Dolica AX620B100 Proline tripod is one of the best we’ve ever come across. You’re getting a lot of features only normally seen on tripods costing two or three times the price of the Dolica, and all packed into a lightweight tripod body that’s guaranteed for 5 years – what’s not to love?! It would be remiss of us not to talk more about the ultra-compact tripod category in this roundup. After all, not everyone needs a travel tripod that can extend up to eye level. The Pedco UltraPod II is an ultra-compact lightweight camera tripod that can be thrown in your jacket pocket, only to be removed and deployed in seconds whenever you need a stable shot. It can hold more than some of the budget tripods on this list, with a maximum load of 6 lbs (2.7 kg), and is loved by both amateur and professional photographers alike (check out the hundreds of positive reviews of the Pedco here). Sometimes referred to as a ‘desktop tripod’, the Pedco UltraPod II is the ideal travel tripod for a photographer who doesn’t want all the bulk of a full sized tripod. It also provides much more flexibility than a regular tripod, thanks to a unique ‘D-ring Velcro cinch strap’. This allows the Pedco UltraPod II to be quickly and easily secured to posts, tree branches, railings, frames or any other (thin) sturdy object. 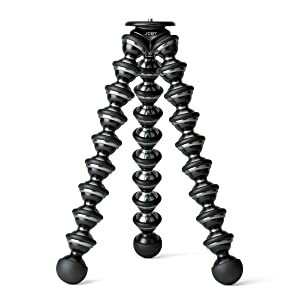 Similar to the Gorillapod line of tripods, this opens up a whole world of possibilities, for both camera and lighting positioning. The D-Ring velcro closure of the Pedco UltraPod II offers almost infinite positioning opportunities. One popular usage of the Pedco UltraPod II amongt wedding photographers is to attach a flash to the base-plate, then to the tripod, then place it up a tree to be remotely triggered via the camera from a distance for a unique back-lit shot. Due to its tiny stature, the Pedco UltraPod II is also perfect for macro photography, allowing a stable shot at a height lower than the other travel tripods in this roundup. The ball and socket camera mount of the Pedco UltraPod II can be adjusted to any angle via a twisting knob, and the universal mounting screw (1/4″) fits the majority of cameras, camcorders and video lights. Above all, being able to throw such a strong and lightweight travel tripod into any sized camera bag allows you to pack simply and move freely. Weighing in at only o.26 lbs (119 g), the Pedco UltraPod II can remain in your camera bag forever, rather than having to be packed and unpacked only for shoots that require a stablised shot. Stabilise your shot in a variety of places using the Pedco UltraPod II Tabletop Camera Tripod. As for build-quality, the Pedco UltraPod II is made from a unique 30 percent glass-filled nylon resin frame with aluminium threaded components and non-slip vinyl feet – all of this adds up to a very robust little unit with a lifetime warranty. Yes, lifetime! The best part about this impressive little desktop tripod is that if you manage to catch it on sale, you can snap it up for under 20 bucks! Click here to check the current price, but even if you missed out, the regular price of $24.99 is sure to appeal to every level of photographer. This makes the Pedco UltraPod II the best cheap tripod available this year out of all those that are recommended by multiple users. In an industry where ‘cheap’ usually means ‘rubbish’, this lightweight travel tripod is a breath of fresh air, and in our opinion should be in everyone’s camera bag. Still in this rather interesting class of mini tripods that are longer when closed than they are when open (! ), here’s a cute offering from the hugely popular tripod manufacturer Manfrotto. Whilst the aforementioned Pedco and Gorillapod may win the battle for versatility, this Manfrotto MTPIXI-B PIXI definitely takes the title when it comes to original design. Even though there are tabletop tripods with more features on the market, none look as good as the Manfrotto Pixi! Beautiful curves and angles aside, the Manfrotto MTPIXI-B PIXI is a simple mini tripod that can be customised to suit your needs. If you opt for the regular Pixi mini tripod which we’re reviewing here, you’ll get the standard ballhead which can be locked and released via a press of the Manfrotto logo’d button. Featuring a standard 1/4″ screw, you can secure any camera/lens combination up to 2.2 lbs (1 kg). The release button on the Manfrotto MTPIXI-B PIXI is suitably stiff, and provides a quick (and fun!) way to quickly fine tune your camera placement. The legs can then be extended to their one position, with rubber padded feet to aid with grip. The shape of the legs of the Manfrotto MTPIXI-B PIXI have been designed to make them easy (and a pleasure) to grip, allowing you to use it as a handheld grip for smaller video cameras, for example. The shape of the legs make the Manfrotto Pixi easier to grip. Other options in the Pixi mini tripod lineup include the Pixi Xtreme with a GoPro type attachment, or the Pixi Smart with a grip to fit most smart phones. The Manfrotto MTPIXI-B PIXI doesn’t offer the flexibility of the other mini tripods on this list but we still decided to include it for photographers who just require something simple that works. Where mini tripods with flexible jointed legs are excellent for wrapping around objects, they fall short when you need them to be perfectly aligned at zero degrees, since the legs need to be extended precisely. That’s where mini tripods such as the Manfrotto MTPIXI-B PIXI come in, with their singular open position, giving you a flat alignment every time. Take a look at how a still-life commercial photographer uses the Manfrotto MTPIXI-B PIXI, and you’ll quickly understand how a tabletop tripod can be used more efficiently than simply positioning a regular tripod close to a table. If looks matter to you, and let’s face it, us photographers are a visually-stimulated bunch, there really is no better looking mini tripod than the Manfrotto MTPIXI-B PIXI. 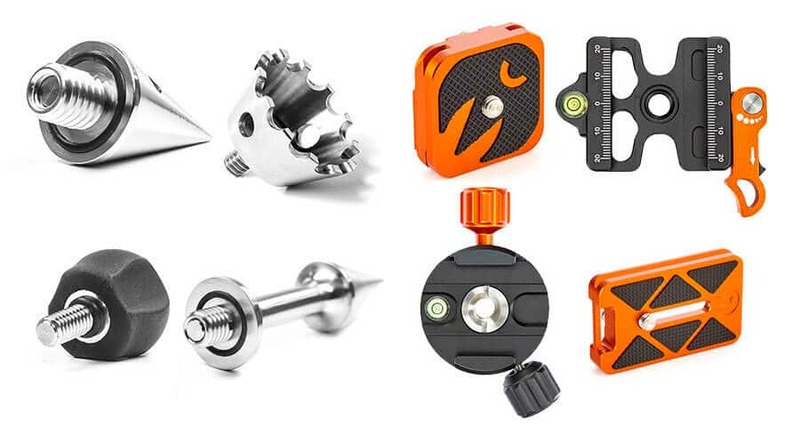 We love the push button operation and the simplicity in design, and for that reason, we whole-heartedly recommend these attractive mini tripods. Don’t be fooled by this tripod’s ‘own-brand’ name – it’s by far and away the most popular tripod on Amazon, if not the most popular tripod everywhere this year. Amazon has a habit of making affordably priced imitation products, but differentiating them just enough to remain unique. It seems like their design team borrows the best design elements from all the leading products in a particular niche, then produces their own bargain priced offering to beat the rest. The simply named AmazonBasics Lightweight Tripod has at the time of writing 5,674 user reviews, the majority of which are raving about just how good value this travel tripod is! The AmazonBasics Lightweight Tripod‘s legs have one fixed open position, held in place by a sliding brace which also serves to stabilise the structure. Tripod leg braces are more common on tripods for videographers who traditionally have much heavier gear, but on a photographer’s tripod, they are still useful for additional reinforcement and stability. The lightweight legs extend via two leg locks which can be easily opened at the same time, allowing the legs to literally fall to their extended position. Set up is extremely fast, going from collapsed to standing in just a few seconds. 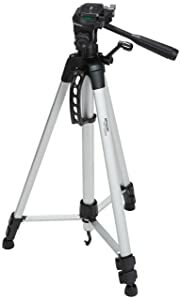 Extending the centre post via the crank arm brings the AmazonBasics Lightweight Tripod to its full height of 62″ (158 cm). There’s one bubble level above the legs to let you know when the base is level, and another on top of the camera plate so you can see when your camera is level. 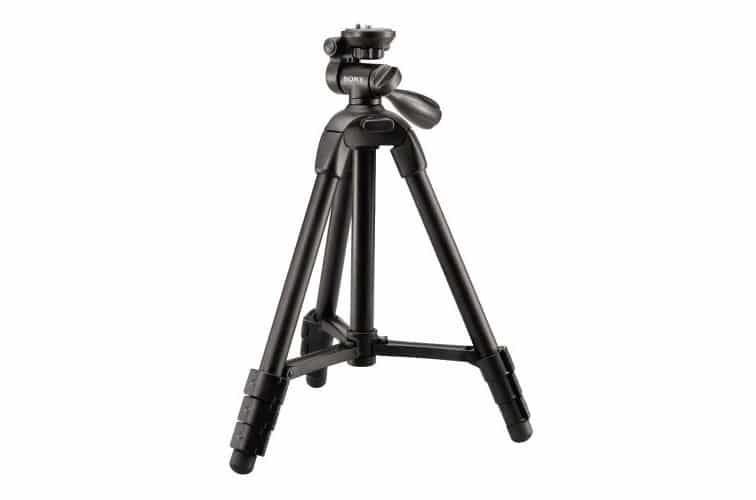 The AmazonBasics Lightweight Tripod features a long-handled panhead for smoother panning. Aside from an included camera bag with no visible branding (going ‘stealth’ is best when carrying photography equipment), there really isn’t much more to be said about the AmazonBasics Lightweight Tripod… other than its excellent price of less than $25 (for the exact price, click here). We included the AmazonBasics Lightweight Tripod in this roundup, due to its simplicity of use, its value for money and its solid (albeit limited) features. It just goes to show that it’s not always the big name brands that rule the roost when it comes to 3rd party photography accessories. Don’t be afraid to invest in more than one tripod – I own 2 Manfrotto tripods, a GorillaPod and a Sirui travel tripod. As we’ve seen, there are a quite a few contenders available on the market so far in 2019. Depending on your usage situations and travel limitations, you should be able to find the best lightweight tripod for you, without sacrificing quality. Affordability is always a somewhat vague consideration, but all the tripods reviewed above should be within the average photographer’s budget. One final word of advice – apart from the couple of cheap tripods reviewed above, it’s generally advisable to avoid any other tripod which seems too cheap to be true. Invest in one of these tripods and be safe in the knowledge that it will last your lifetime as a traveling photographer, and do its duty of supporting your camera safely and steadily. Sirui T025X. Only 752grams and folds to 30.5cm. Max height 1.3m. Great for mirrorless. I’ve been using it for couple years now and its always with me everyday. Ah yep, some Sirui reviews coming here soon actually Izham. They’re great value for money. What would be your thoughts on this tripod? My friend told me to give it a try but I’m not sure if it would be good from my small camera (the camera is pretty light). Hey Roland! What is your camera/lens? It looks like an ok tripod, but depends on what weight you attach to it. After reading the travel tripod reviews I purchased a ZOMEI Z699C tripod for my travels. On the first trip the bottom section of one leg dropped off. It rolled off a jetty and was lost in the sea so I couldn’t recover it. Zomei is not responding to my emails concerning either a warranty claim or the supply of a replacement leg for a repair. Hey Robert – when you say it dropped off, did you loosen the leg to the point where it came off? All tripods listed here will behave in the same way if you keep twisting and twisting a leg. I can reach out to Zomei on your behalf, but it depends on the circumstances surrounding the incident. Hi mark, you have put great effort but please also guide me that which is best shooting tripod among these with good quality and affordable price. What are your criteria Rachel? Sure thing Lewis. I have that Pixi too – it’s a great alternative to the Gorillapod when you need something a little simpler. I suppose there is a mistake in data about Gorilla weight. Great spot Gienio! Thank you – I’ve fixed it now. Here is my issue. I want a more compact version of the alta pro, something that is more between 3 and 4 lbs. Just not gonna happen. LOL. While the Oben CT3535 Carbon Fiber Tripod is good for a mirrorless or small DSLR with a smaller lens than the typical 70-200mm zoom, a much more robust Carbon Fiber Travel Tripod than CAN handle any 70-200 f/2.8 zoom on any DSLR or mirrorless camera, is the FLM CP26. It is absolutely Awesome, and the ball head has numerous features, some of which are unique to the brand, such as a Pan function that can ratchet 360 degrees in 15-degree increments…great for precise panoramas! It is superbly well made, a marvel of engineering and design! Highly recommended. FLM-Canada supplies the US. Happy Holidays! If i’m not mistaken, the vanguard pro isn’t a travel tripod. This review is a bit misleading. Actually, I stand corrected – maybe I should of read the start of the review! Is the Zomei review of the 669 or the 699? Obviously you mention the 699 a lot but the link and specs seem to be for the 669. Hey Irvin, it’s the 699. I’ll double check those links – thanks for pointing that out! Hey Peter, I intend to update this list in 2018 with a couple from 3LT – great tripods, I agree. I spent ages assessing tripods before buying one a couple of years ago, so I was pleased my decision of a MeFoto Roadtrip was validated by your review which I just read now. I also want to add that the two fixed positions of the legs hasn’t restricted me one bit, especially as you can take out the central column of the tripod and put it back in upside down, so the camera actually hangs underneath the tripod to get really close to the ground. Thanks for sharing that Paul – good to know there’s a better plate out there for the Roadtrip. The Velbon Ultra Voxi L is the best travel tripod that I have used. It’s folded length is only 36cm and I can set up and put away faster than any other tripod on the market. I’ll add it to my list to review – thanks Dennis! Very helpful thank you, I’ll be using it while I’m out in the field conducting research so really need to save space, the Pedco looks perfect for what I need. Mark, a good article, though I realize that selecting a tripod, like cameras or camera bags, is a subjective thing indeed! 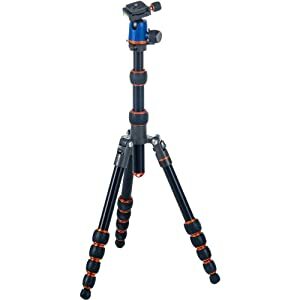 John, check out the Oben CT3535…it’s a sturdy little carbon fiber travel tripod that converts to a monopod. See specs online, but I can say that it’s great for a mirrorless kit, or even a small DSLR with a wide or mid-range zoom. The quality is quite high. IMHO, I’d avoid the cheaper tripods with a fixed center column or leg spread. They won’t work at all on uneven terrain!! Hey Steve – thanks for the tip re. the Oben CT3535 – will check it out! I’m a fan of the Rangers 55″ tripod/monopod; it’s simple, inexpensive, and gets the job done. Ah yes, I need to add this one to the list Matthew – only came across it last month, but have been hearing lots of great reviews about it. Here it is for anyone interested. Not sure how you could have possibly missed the most popular in terms of coverage (YouTube, forums, reviews, etc) the Sirui T-005X (or the carbon version Sirui T-025X. What about the Sirui T-025X Carbon with C-10S Ball Head??? I heard is no less than the MeFOTO Aluminum Roadtrip, maybe even better. I’ll have to check that one out, Omri – thanks for the tip. 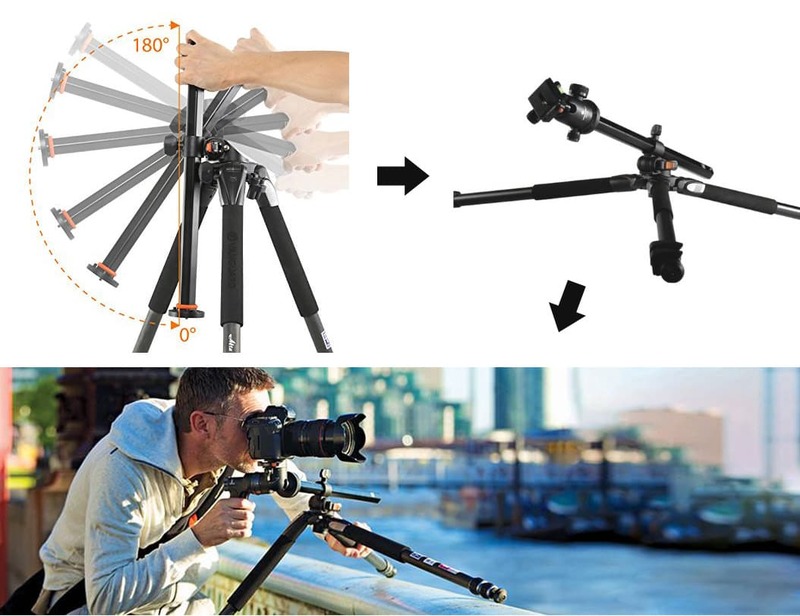 Has anyone tried K & F Concept tripods? Bradley, yes, I agree that Gitzo is the best in terms of build quality and reputation, however, for about 1/3 the price, I find that the Oben CT3535 Travel Tripod is great for a mirrorless or small DSLR system. It is carbon fiber, with all metal control knobs, and quite well built. The Vanguard Alta Pro is seriously the best tripod out there. I freaking love mine. To be able to shoot from directly above is great for product photography and stop motion. While I have no experience with the Vanguard tripod, and have no doubt it serves your purpose, I recently came across a unique and extremely high-quality travel tripod…the FLM “CP26 Travel Tripod”. It has super-strong 10x Carbon Fiber legs (26 lb load capacity!) with well-made twist locks, and a ball head that has several unique features that I’ve not seen in my 35 years of photography using tripods…For example, the “Pan” function permits butter-smooth normal panning, but in addition, adds a 15-degree ratchet function that is fantastic for us landscape/panorama photographers! There is also a “Tilt” knob that locks the ball head so that only one vertical/up/down plane is available. And finally, there is a “lock” function that locks the ball head from panning/turning, so that it can easily be unscrewed and/or mounted solidly. The kit comes with very well-made screw-on metal spikes, and folds up to a compact 15.5″ for travel. Quite ingenious and precision design overall, and highly recommended for travel!! Bottom line: This FLM tripod simply exudes Quality. Here’s the link to that awesome tripod: http://www.flmcanada.com. Please tell Ari that Steve sent you. Thanks, and I think you’ll find the FLM CP26 Travel Tripod stunningly robust, and a work of art! 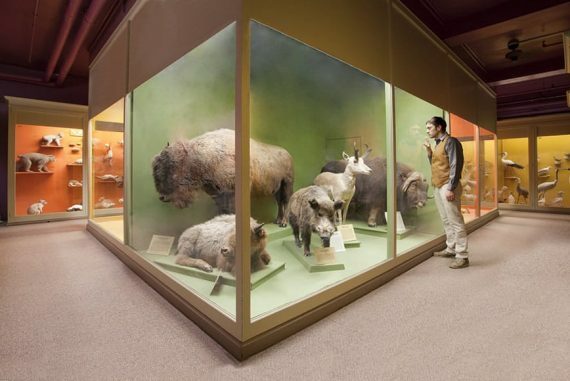 Hey Steve, thanks for that – very interesting indeed. I’ll see if I can get my hands on the FLM tripod you mentioned to review later this year. I’m also a big fan of the CP-26 Travel. I have this and a CB43-FTR ball head and it’s excellent. I’ve taken it hiking in the Scottish Highlands, and regularly use it for my Sinar Norma large format camera. For me it’s perfect because of the load capacity and the exceptional ballhead. The friction control is very smooth, and when you have a heavy camera it’s also very important.